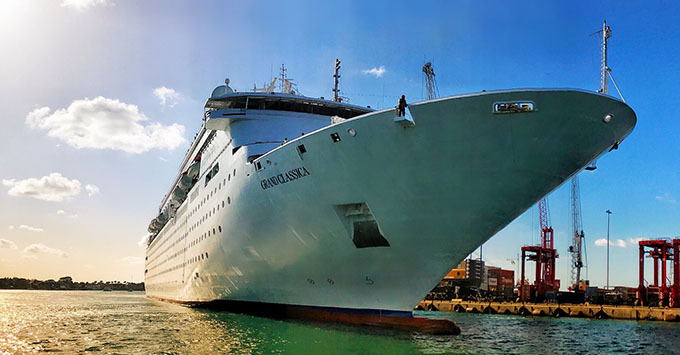 (2:20 p.m. EDT) -- Bahamas Paradise Cruise Line's newest ship, Grand Classica, sailed into the Port of Palm Beach this morning for the first time. With the sun shining brightly, the local Bak Middle School of the Arts band played as the ship slowly glided into the pier. "Welcome to our Italian beauty," said Bahamas Paradise Cruise Line's president Kevin Sheehan Jr. at Grand Classica's naming celebration in front of a crowd of dignitaries, travel agents and the media. "This is a magical moment for us." "It's a great day for the Port of Palm Beach, for Palm Beach County, for Bahamas Paradise Cruise Line to have another ship in our backyard," said Oneil Khosa, chief executive officer of Bahamas Paradise Cruise Line at Grand Classica's naming celebration in front of a crowd of dignitaries, travel agents and the media. On hand was also Palm Beach County Mayor Melissa McKinlay (who had never stepped foot on a cruise ship before), who declared April 13 in Palm Beach County MV Grand Classica Day. The Minister of State for Grand Bahama J. Kwasi Thompson and Port of Palm Beach Executive Director Manuel Almira were also present. Grand Classic is slightly larger than fleetmate Grand Celebration with a capacity at 1,680 passengers at double occupancy (vs 1,502 for Grand Celebration). The ship has 10 decks and 658 staterooms, of which only 10 have balconies. The ship also eight dining options, three more than Grand Celebration, including a new-to-the-line cook-your-own meal venue called Rock Grill. Also new for the line is an adult-only pool area with two hot tubs and a bar.